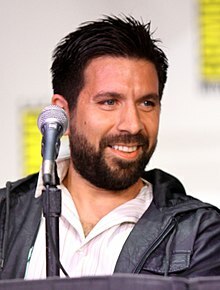 Joshua Eli Gomez (born November 20, 1975) is an American actor best known for his role as Morgan Grimes on Chuck. He is the younger brother of actor Rick Gomez. Gomez appeared in a recurring role in the CBS series Without a Trace as computer tech James Mackeroy. He appeared in a series of IBM commercials, a series of Wendy's commercials (Ranch Tooth), and a commercial for Garmin. He also made a cameo on Freddy's Nightmares. He played Sammy Stinger in Bring It On Again, 2004. As a voice actor, Gomez played Baralai in the video game Final Fantasy X-2, opposite his brother Rick's character, Gippal, and as Parker in Turok. He also had a small part at the beginning of BioShock as Johnny. In September 2007, he began starring in the NBC series Chuck as the title character's friend, Morgan Grimes. Gomez is friends with Chuck co-star, Zachary Levi, in real life. Joshua was nominated for Outstanding Male Performance in the Comedy Television Series at the 2008 ALMA Awards. 2003 Last Man Running J.J.
2001 Law & Order Edwin Morales Episode: "Possession"
2009 Imagination Movers Captain Kiddo Episode: "The Tale of Captain Kiddo"
2013 Castle Simon Doyle Episode: "Time Will Tell"
2014 The Crazy Ones George Episode: "Heavy Meddling"
2017 Scorpion Dave Blakely Episode: "Queen Scary"
2018 Lucifer Neil Berger Episode: "The Last Heartbreak"
^ "2008 ALMA Awards" (PDF). ALMA Awards. Retrieved 18 October 2016. Wikimedia Commons has media related to Joshua Gomez. This page was last edited on 6 November 2018, at 21:39 (UTC).